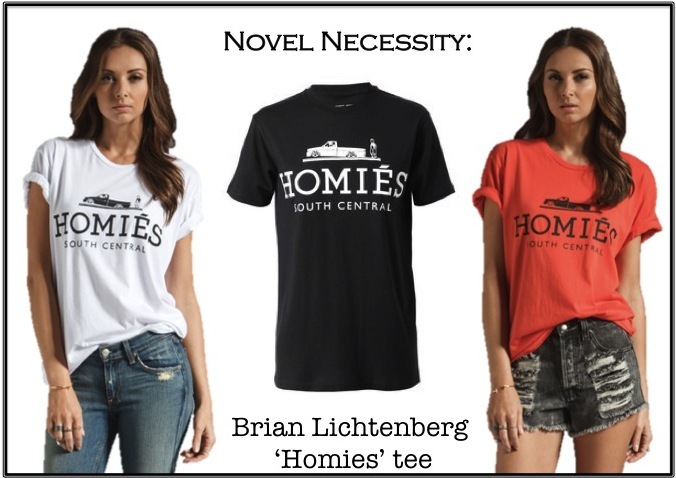 A Bit of Sass: Novel Necessity: "Rollin with the Homies..."
Novel Necessity: "Rollin with the Homies..."
I'm kind of in love with Brian Lichtenberg's "Homies" tee. My only issue is I can't decide which color to get! But of course this sweatshirt version in black with gold screen printing is pretty insane as well... Miley Cyrus has rocked a couple versions of Lichtenberg's Homies design. Instead of going casual like she did, I would dress it up with a blazer or maxi skirt for a cheeky juxtaposition. Oh, and if an ode to South Central isn't your style, check out Brian Lichtenberg's Feline tee. I love that shirt! I just saw a pic of Miley rocking one...so effortlessly cool! my friends and i are dying over these tees. Still a little time to enter my ShopSeptember sweater giveaway! Totally amused by these - I almost bought a Feline sweatshirt but I don't know if I'd ever actually wear it! the one in white is really chic!